Rogue Wave! Tsunami of Talent Can't Save "Disaster!" Catherine Ricafort, Roger Bart, Baylee Littrell, Seth Rudetsky, Rachel York, Kevin Chamberlin, Olivia Phillip head for daybreak. Below, Adam Pascal has a sinking feeling about his off-again, on-again relationship with Kerry Butler. Winters is said to have trained with an Olympic swim coach to lend realism to her character. Rudetsky --perhaps lesser-known, but no less committed to his craft -- hosts a theater program on Sirius/XM radio, and a live weekly cabaret show. As an accompanist, he has an illustrious career that’s led to relationships with a who’s-who of theater glitterati. With this slight, silly, campy and cornball musical comedy, now open at the Nederlander Theatre, many of those celebrities are, I imagine, expressing goodwill for a bona fide Broadway hero. They can consider their debt paid. By the time “Disaster” was over, I had laughed some, but mostly I was rooting for the piranhas. It’s 1979, and Adam Pascal (“Rent”), Kerry Butler (“Xanadu”) and Faith Prince (“Guys and Dolls”) are all on board for the opening night of New York’s first floating casino and discothèque. Things aren’t going to go well, though, because the developer, Tony (Roger Bart, of “The Producers,” etc. ), has skimped on nuts, bolts and fire doors, a la "The Towering Inferno." 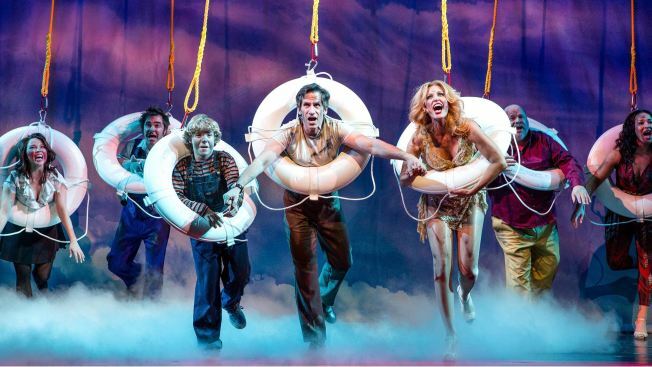 Rudetsky is both a co-star and—alongside director Jack Plotnick—co-author of “Disaster,” which features a melange of the era’s cheesiest songs, inserted, and often pummeled, into the book in such a way that they’re meant to exist as an extension of the dialogue. So, an argument between two characters spurs one to a snippet of Harry Nilsson’s “Without You”: “I can’t live …” And, a moment of another’s self-empowerment is a bridge to Helen Reddy’s “I Am Woman.” There’s no original music, and it's rare we hear more than a few bars of the famous song we may cherish. Bart is in familiar waters as the dastardly developer with a wandering eye. Butler, as a newspaper reporter trying to make her mark by uncovering Tony’s ill-done deeds, is paired with Pascal, as the waiter she once left standing at the altar. Can there be a morning after for them? Jennifer Simard (“Sister Act”), as a guitar-playing nun—say, wasn’t that Maureen McGovern in “Airplane!”?—is as close to a savior as this show has. The ensemble includes Rachel York, Lacretta Nicole, Max Crumm and Baylee Littrell, the teen son of Backstreet boy Brian Littrell. When your ship is upside down, there’s only one place for a ragtag group of survivors to head—to the top, which used to the bottom, where there’s a hatch. Up there, it’s daybreak. Or rather, “Daybreak.” Before you can say “Barry Manilow,” this ship has sailed. Next time, let's all just wave from shore. “Disaster!” Through July 3 at the Nederlander Theatre, 208 W. 41st St. Tickets: $65 and up. Call 870-250-2929.